Happy new year! If you've ever seen a rally course book, you might be familiar with Tulip diagrams. 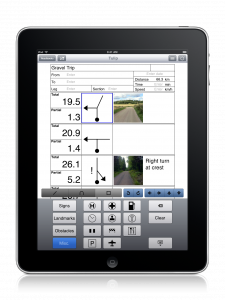 The people at Long Haul Software have designed a iPhone/iPad Roadbook Editor that draws and shares diagrams for building route notes. We've noticed an uptick in Rally events held on MSR over the past year. Maybe tools that combine modern technology with good ole fashioned Sunday drives could get younger people interested in participating?